You often see huge, seasonal artichoke heads in the supermarket, and as exotic as they are - there is no obvious part that looks remotely edible. And you would be right. All the tasty goodness is hidden away inside and without being pointed in the right direction, you are likely to give up trying to find it after your first bitter taste of an artichoke petal. Yes, a petal - because the artichoke is nothing more that a huge, cultivated thistle flower! The first thing to be aware of are the thorns that could be sticking out of the end of the outer petals. While some shop bought varieties are almost completely thornless, seed grown plants will often show a little genetic variation which can result in a rows of wickedly sharp thorns - do not put them in your mouth! The petals themselves are bitter tasting and inedible, however once cooked in boiling water these easily peel away from the base of the flower head. However, at the base of the removed petal is a tiny morsel of delicious artichoke heart which can be scraped off with your teeth and eaten. Unless the artichoke is very small, you will definitely want to avoid the hairy choke. 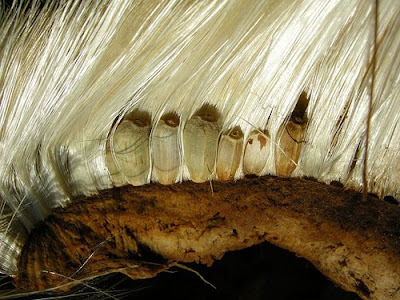 When left to mature on the plant, these hairs go on to produce part of the seed body and if by accident you happen to get some of the choke in your mouth, the texture of it is so unpleasant you will have no alternative that to spit the whole thing out! 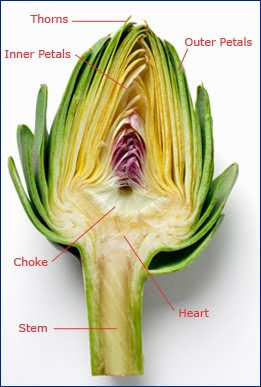 The stem is also bitter tasting, however where it attaches to the heart, it too possesses some of that gorgeous artichoke flavour. SO, WHICH PARTS OF AN ARTICHOKE CAN YOU EAT? The heart is the most delicious part and the only piece that is truly coveted by the gourmet chef. The base of the outer petal are also particularly nice, and are traditionally eaten along with a tasty, creamy dip. On juvenile artichokes you can eat the choke as well as the bottom half of the inner petals. As mentioned previously, you can also eaten the internal part of the stem that is nearest to the choke.